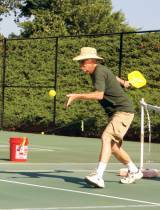 “Pickleball is incredibly easy to learn and maddeningly addictive,” Ann says. “Because of the combination of physical activity, competitiveness, social interaction and fun, it appeals to players of all ages. It’s the game of choice for active seniors, and I think it will be the dominant court game before too long. I can’t speak for everyone, but if you’re looking for an activity where you can play for little investment and almost anywhere you can play tennis, this is the sport for you.” So, you want to play Pickleball?